I didn't get to watch the game, I already knew how it was going to turn out. 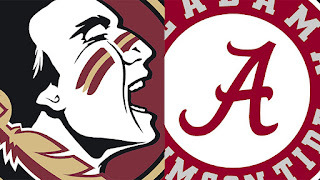 FSU 7 - Alabama 24. No, I didn't know the score otherwise I would be a rich man right now. What I did know was this. FSU was going to lose. How did I know that? Because Alabama was that good? No - because FSU knew they were going to lose. The only question was, how bad. Before the game I was listening to the local FSU fan base, what did they think? They thought they were going to lose. They had given up. In fact, one fan said, "We need to pray! That FSU doesn't lose by too much." But at half time, when they interview the coaches for 30 seconds, they asked Alabama Coach Saban what he thought. He acted surprised. He said that they had made a lot of mistakes implying that FSU should be in the lead. So why weren't they? FSU wasn't capitalizing on Alabamas mistakes. When you underestimate your opponent - they will beat you. When you overestimate your opponent - you will beat yourself. This can apply to your faith too. In either situation, you will fail to make the investment and sacrifice needed to succeed. FSU placed more faith in the situation and determined it to be bleak rather than looking within themselves for what they needed to win.